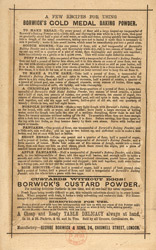 Baking Powders like Borwick’s were very popular as they revolutionised domestic cookery. Housewives had made their own yeast (with ingredients ike water, flour, potato and sugar) to add to bread and cakes but results were inconsistent. Baking powders reacted with liquids and released carbon dioxide which caused the breads to rise. George Borwick started selling his powders on his market stall in Walthamstow market.